Motorcycles generally have a very limited luggage carrying capacity and as a result motorcycle riders end up carrying most of their luggage either in their saddle bags or in their backpacks. The option which enables the luggage to be hooked on to the bike is always recommended compared to the option on which rider has to take the load by carrying the stuff himself on the back, like in case of a backpack. In such case, the backpack creates a continuous tension on the back of the rider, and hence it is uneasy and creates fatigue in long distance riding. So apart from side saddle bags, the limitation of a motorcycle’s luggage carrying capacity can be overtaken with the addition of aftermarket luggage straps. Five years back, it was rather easy to choose down what you needed because of limited options. But these days a number of straps are present in the market hence it has become extremely important to choose the right product as cheap ones can create a serious safety issue when least expected. Why you shouldn’t go for any XYZ luggage straps present in the market? The top reason why you shouldn’t go for every other luggage strap in the market is because such products aren’t properly tested to perform in the extreme conditions. Imagine if you are doing 100kmph on a freeway and have your luggage properly tightened up at the rear of the motorcycle using luggage straps. And after a few sudden jerks, the straps break away letting loose all your luggage in middle of the highway. You wouldn’t really want that to happen, isn’t it? 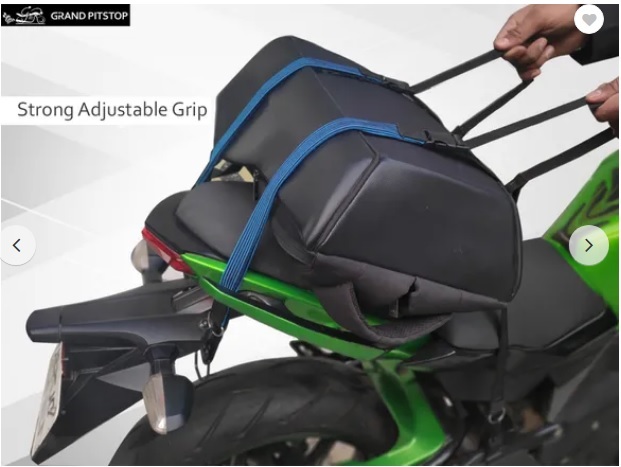 Hence GrandPitstop has introduced the new Bungee Cords/Luggage Straps which have been developed taking close inputs from the motorcycle riding community. These straps are highly compatible with all kinds of motorcycles present in the market today and can be used on any bike. 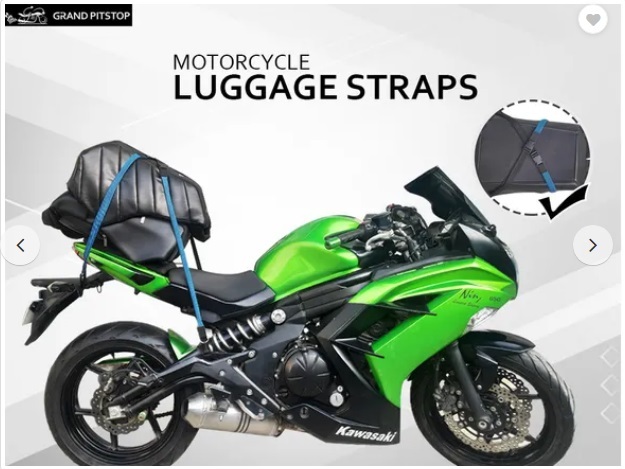 Other straps come with metal hooks which are unstable and ruin motorcycle paint surface, on the other hand, this product comes with snap hook safety feature which keeps the luggage intact and hooked on to the motorcycle irrespective of the riding conditions. Also it features shatter and crack resistant buckles which promises utmost durability. The bungee cords are adjustable for length which makes them ideal for all size of luggage. The length can be stretched for big bags while at the same time it can be adjusted short for small backpacks. And doing so is very handy due to its smart design, unlike other products where you have to circle the bike several times to tighten up the luggage. These straps are made up of top quality Nylon double stitched material with high elastic properties and do not lose elasticity even after prolonged usage unlike other products. Its fail safe design ensures that the luggage remains intact no matter what. Buy this product from GrandPitstop.com at a current discounted price of Rs 699. And stay tuned for more such informative updates.